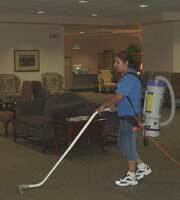 You get an instant, customized bid designed to your company's cleaning specifications. A highly trained specialist in the janitorial field will submit a comprehensive and accurate bid to you within 48 hours. You get a full cleaning crew every night. We understand our market and we control absenteeism. Big "M" maintains an on-call substitute list with a ratio of at least one back-up for each employee. The key to our system is managerial control: we take an active interest in making sure that you are satisfied. You save money! Big "M" is efficient, and these savings are passed onto you everytime we service your building. We design a program that will meet your needs as well as your budget.